While at last fall's ASJA conference, I sat down with the folks of AuthorLearningCenter. Here are a couple of short clips from that interview. I spoke with my editor about the biography I’m writing about Thomas Jefferson. An email on Monday said she’d call on Friday. Nerve-racking anticipation for 4 days not knowing if she’ll have good news for me, or, as I always assume, bad news. This time my fears were unfounded. She had great ideas and suggestions for me, as usual. I appreciate that she is my fresh pair of eyes. I have been living with my words for months, so I no longer see gaps in the narrative, or places where I’ve tickled a reader’s interest but not scratched the itch. And then there are places where I haven’t supported my theme. I’ve stated it, but not shown the proof. So, it’s back to research to find those details in history that illustrate the nation growing as a result of Thomas Jefferson’s influence. His last line makes me feel that I am in good company. Malone spent some 40 years studying and writing about TJ, and yet he still had moments where he felt like he didn’t know enough. How arrogant I am to attempt to excise a sliver of TJ’s life and offer it to children with any kind of confidence. I hope the 13 books I have stacked on my desk will help. (I know that a replica of TJ’s revolving book stand would help. It held 5 books open at once for easing viewing. That is the one thing I wanted at the Monticello gift shop and the only thing they don’t sell. I could have gotten TJ bookmarks, coasters, wine racks, tea towels… but no book stand.) The hours I have spent reading his letters online and at the TJ library have to count for something, too. I sometimes wonder why I write nonfiction. I can't handle the truth! A minefield of potential errors stretch out in front of me, and that’s not including my normal angst for making mistakes. Dates can be wrong, names can get screwed up, events misconstrued, and you know there are thousands of TJ enthusiasts who are ready to pounce on any little misstep. I can’t tell you how many times I’ve typed 1983 rather than 1783, and written Madison when I meant to write Monroe. Clearly, I have to get these two guys defined in my head so that I have just as sharp an image of them as I do of TJ or George Washington. When you write a biography, you are never writing about one person or one time or one event. You are always chasing down a succession of details that radiate out from your subject like ripples around a stone plunked into a still lake. Where do you stop? When the ripples or details take you back to shore? No. Then you double back verifying those bits of information as they radiate back to the source to make sure that, yes, those pieces fit. Those connections connect. His cause had an effect, and vice versa. See where I could go wrong? Why do I do this, again? The other day, Vicki Cobb, science writer, speaker, and founder of iNK Think Tank spoke with Mark Gura in a Literacy Special Interest podcast. Hang in there, Mark is a little coma-inducing, but when Vicki gets on you'll perk right up. My favorite part is her description of story and communicating with an audience. She says, "The way that story gets processed through [ a nonfiction writer's] brains and comes out through their fingertips on the keyboard is where the humanity comes in, in the storytelling of the real world." She goes on to say, "It is revealed humanity -- who you are as a human being -- that is the subtext, the common denominator of all authentic communication. That's how you connect with people." Growing up, I spent a lot of time in the nonfiction section at the local library. My passions varied. Sometimes it was Indian lore and how to make a teepee (mine never stayed up), horses, kitchen science, or true ghost stories at Halloween. Basically I preferred the real world over a fictional one. I still do. That’s probably why I write nonfiction for kids today. Rah, Rah Radishes! 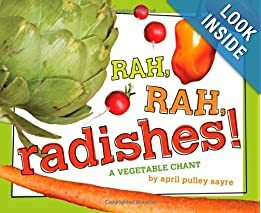 A Vegetable Chant by April Pulley Sayre is a rollicking rhyme through a farmer’s market. A great read-aloud for little ones (and teenage grocery clerks who don’t know bok choy from broccoli). 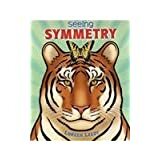 Seeing Symmetry by Loreen Leedy will catch a young reader’s eye with the tiger on the cover. And the clear text and bright artwork inside will have your child checking out the symmetry in your face, your food, your furniture…. Older students will enjoy Those Rebels, John & Tom. 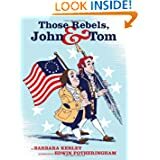 Author Barbara Kerley turns stone-faced historical figures John Adams and Thomas Jefferson into real people who worked together and argued to create a nation. Edwin Fotheringham’s humorous art perfectly captures Kerley’s take on these two amazing men. 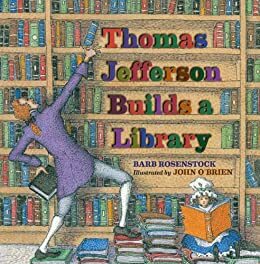 You can follow that up with Thomas Jefferson Builds a Library by Barb Rosenstock. It tells the story of how book-crazy Jefferson helped create the Library of Congress. Each page is filled with John O’Brien’s rich illustrations and primary source quotes. Need to explain the Big Bang? 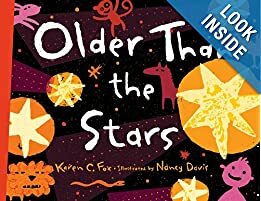 Then grab Older than the Stars by Karen C. Fox. The main text written in the style of The House That Jack Built can be read by young readers, but those interested in the science behind the “puffs” and “bangs” can read the side text about atoms of helium and hydrogen, gravity and galaxies. 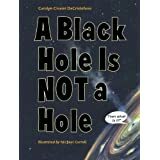 A Black Hole Is Not a Hole is a fun look at a dark subject. Carolyn Cinami DeCristofano’s conversational style is right on target for any curious middle-schooler (or adult) who wants to know how scientists know about stuff they can’t see. 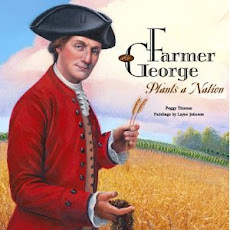 So, if your child gravitates to the nonfiction section of the library – Celebrate their passions! Together you can learn about lizards, or lasers, or (like one kid in my neighborhood) Liberace (and hope the fad fades fast). 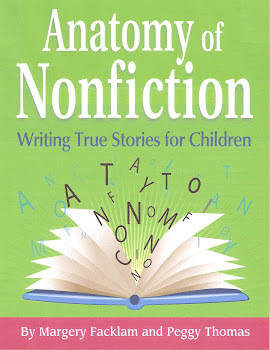 For more award-winning nonfiction ideas checkout http://inkthinktank.com/.